Following Gramophone Editor’s Choices for their recent excursions into the sacred music of Bruckner and of Gabriel Jackson, Duncan Ferguson and the Choir of St Mary’s Cathedral, Edinburgh return, in their fourth disc together, to the epoch of their first recorded triumph - the early 16th century. Their 2010 Taverner disc won plaudits for its exhilarating freshness and panache and the choir bring the same musical and liturgical integrity to music by Taverner’s near contemporary, John Sheppard, Informator Choristarum at Magdalen College, Oxford (where Ferguson himself was a more recent organ scholar). 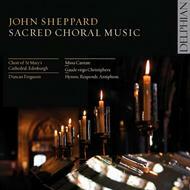 Centred on Sheppard’s most extended and ecstatic composition, the 'Missa Cantate', this wide-ranging collection also includes the rarely-heard 'Gaude virgo Christiphera', Sheppard's only surviving votive antiphon (with a new reconstruction of the treble part), and the first recording of 'Adesto sancta Trinitas II'. Most remarkable of all is the performance level to which Ferguson has now brought this choir, and the expressive force given to the music by the astonishing agility of voices in the vast cathedral acoustic.